I posted a while back on olive history and have previously offered a couple of recipes that include olives. (Just type “olives” into the search bar at right, if you’re interested.) They are tremendously important fruit, especially among Mediterranean cultures. News of their health benefits has given olives and olive oil a great boost in the last decade or so in the United States. 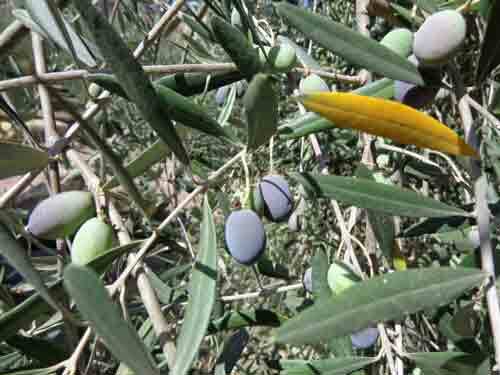 Countries with the right, Mediterranean-type weather, including Australia and South Africa, are now growing olives and producing excellent olive oils. Happily, the Mediterranean climate of parts of California have made that state a wonderful producer of olives and olive oils, as well. Ojai Olive Oil has olive trees from several of the major olive oil regions of Mediterranean Europe, including France, Spain, and Italy. Apparently, both the soil and climate are ideal for the olives, and the trees show their gratitude by producing abundant olives, all hand picked. In addition to being shown around the orchards, we also got to see the crushing equipment and then, best part, got to taste about a dozen different olive oils. Wow. We were told that the intense, complex, fruity, peppery flavor of course reflected the health and quality of the trees and the care of the process, but also demonstrated the difference freshness can make. Any olive oil shipped from Europe, unless you had it air freighted yourself, will likely be many months old by the time it reaches the grocery store shelf. It will still be good, but it probably won’t be great. For great olive oil, you not only want to buy good quality but also as fresh as possible. I had always wondered why olive oil I had in places around the Mediterranean always tasted so much better than oils I had at home, and now I knew why. Because of the freshness factor, a California olive oil may offer your best opportunity to taste how good this oil can be. Of course, I can offer from experience a definite thumbs up for the oils from Ojai Olive Oil, but it is not the only good olive oil company in the U.S. But you owe it to yourself to try to find something really fresh and brilliant, so you know why olive oil is so revered in so many places. 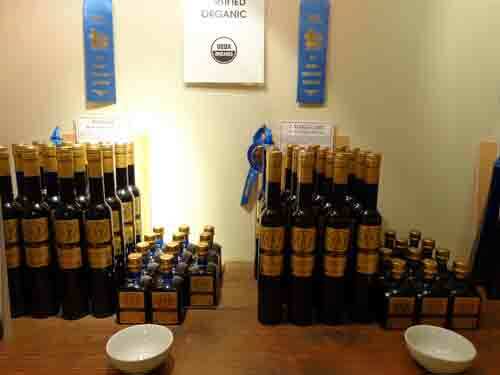 But if you are interested in seeing what the Ojai operation offers, here’s their website: Ojai Olive Oil Company. Enjoy.